There's a secret tucked inside this classic accessory: a steel bottle opener. Fun fact: Your bowtie is a party animal. Tucked inside this classic accessory there's a secret steel bottle opener. Oh yeah, we went there. 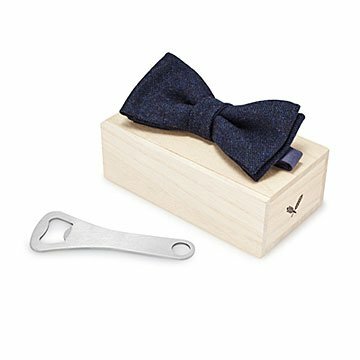 Great for weddings or bachelor parties, the wool tie has a special compartment that keeps the opener secure until it's time to crack a cold one. Slip it out, and show the crew that you're business in the front, party in the back. Fastens with a metal clip. Made in China.